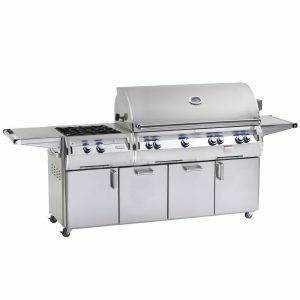 Main Grilling Area: 792 sq. in. 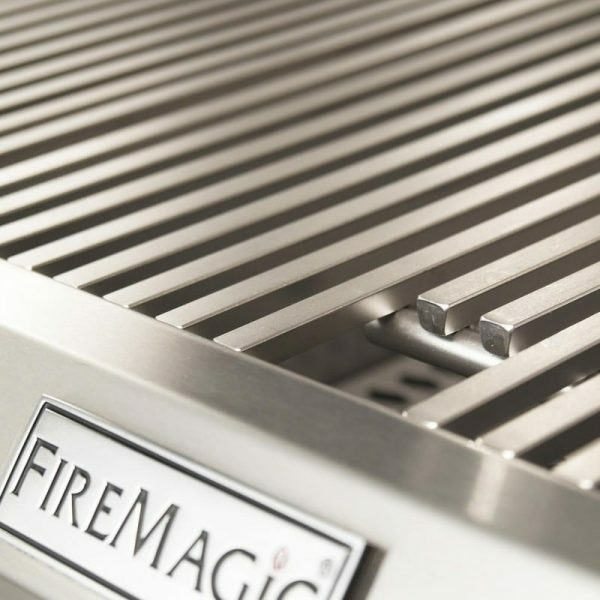 Create an entire multi-course meal with the Fire Magic Echelon Diamond E790s Cart Mount Grill – Double Side Burner. 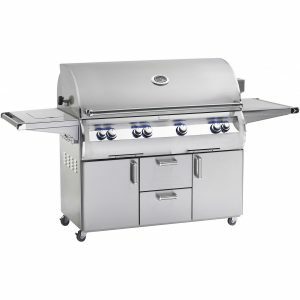 This grill has excellent power, durability and looks. The Echelon Diamond Series has rounded edges and mirrored highlights to hint at the high performance and exquisite craftsmanship under the hood. 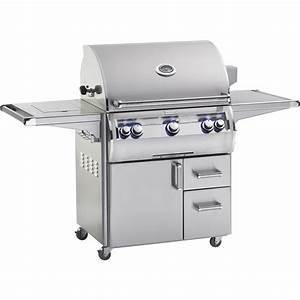 Powered by exclusive cast stainless steel “E” burners, this grill is guaranteed for life with the best warranty in the industry! The flavor grids are engineered for durability and even heat distribution. 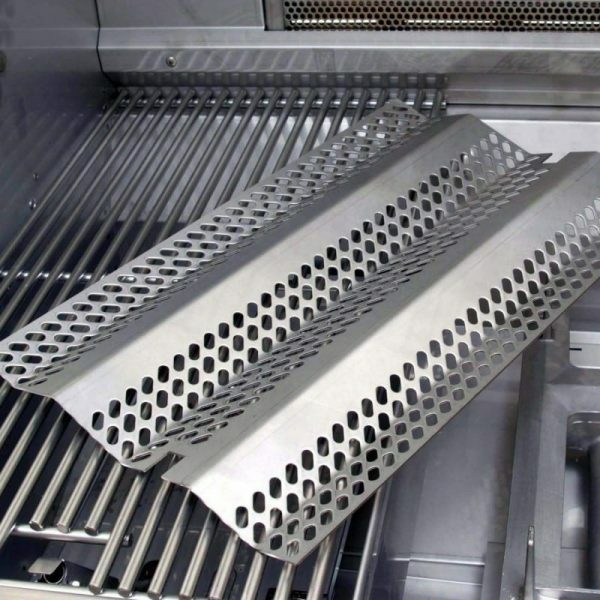 The heat zone separators allow you to isolate cooking zones so your food may be grilled at different temperatures. The recessed back burner allows for up to a 17″ diameter roast! 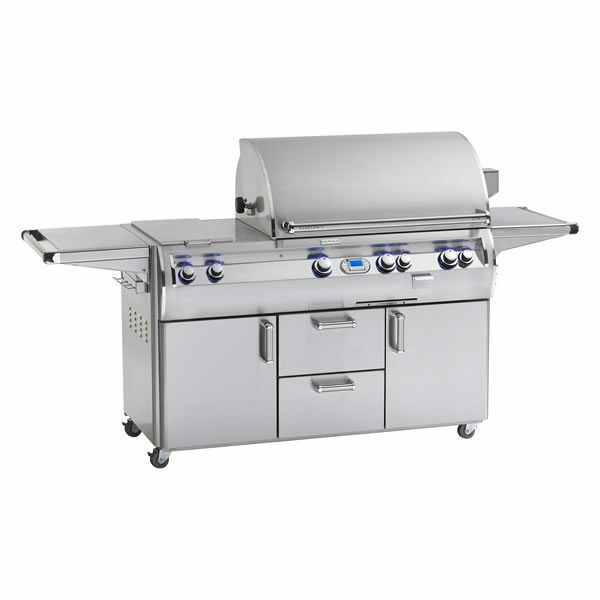 The rotisserie features roller ball-bearings to support the rotisserie spit rod with a super high torque motor and two 4 skewer meat holders with heavy counter-balance. There’s built-in storage brackets for the rotisserie spit rod. 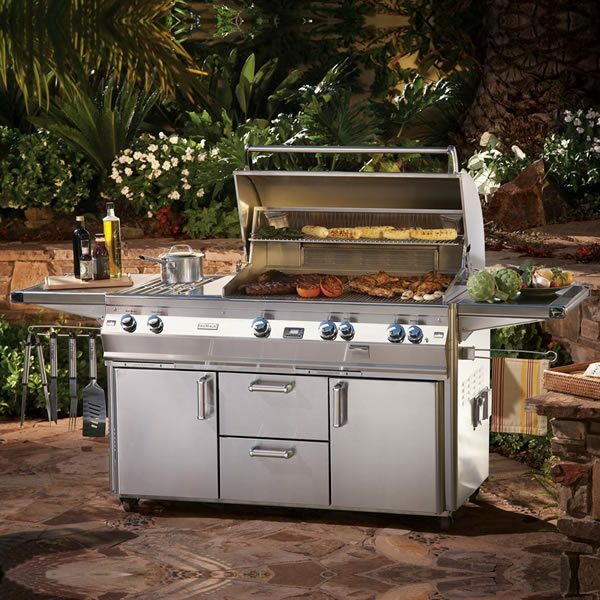 Plus, you can get in and out of the grill easily with the feather-light, easy lift over hood with spring assist. The hot surface electronic ignition system is the most advanced and reliable lighting system available. 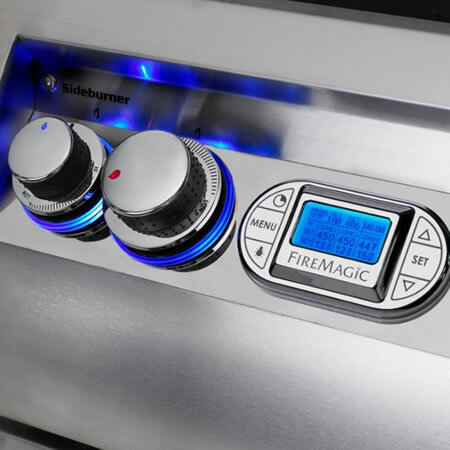 Simply push in the control knob to activate the hot surface, turn up the gas and light your grill. The state of the art electronic thermometer display is loaded with an impressive array of features such as a timer, digital temperature grilling guide, choice of back-lit display colors, high temperature limit set and over light switch. Batteries are not required. 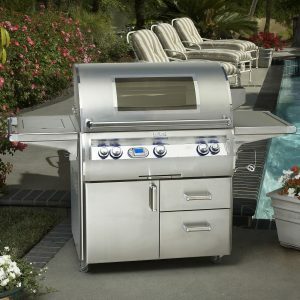 The grill knobs have blue LED back-lights, casting a luminous glow against the reflective stainless steel. A flame icon in the knob changes from blue to red when the knob is turned on. The red flame’s intensity grows brighter on high and dimmer on low, visually signifying the burner’s setting and letting you know at a glance when gas is flowing. This feature is found only on the Diamond Series Grill. 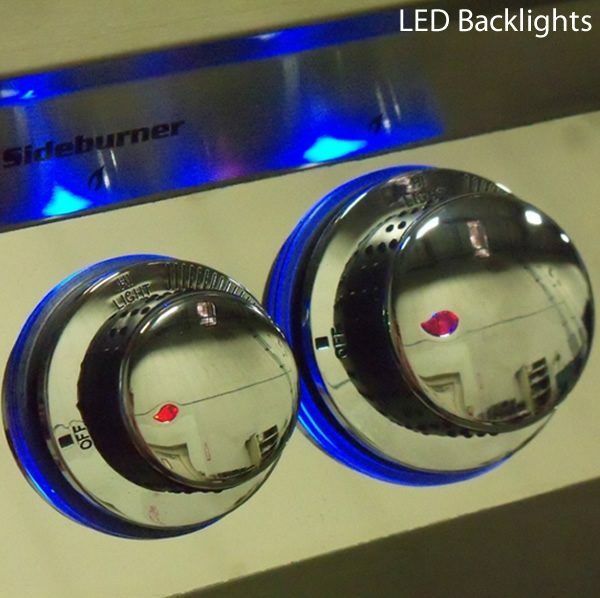 Keep the grill lit easily with the built-in halogen lamps. Strategically angled at 15 degrees, they shine brightly over the grilling surface. The absence of screws in the design allows for quick cleaning with a damp sponge. Bulbs are easily replaceable by removing the Pyrex lens. 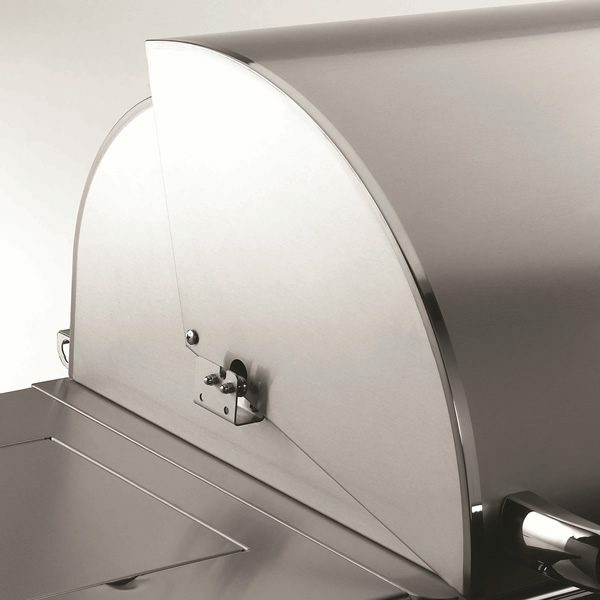 The wood chip smoker features a stainless steel wood chip drawer with its own 3,000 BTU dedicated burner. Add fruit juices, wine, or simply water to your choice of mesquite, oak, cherry, or other woods for grilled foods enveloped in a delicate smoky flavor.